Congratulations to current OFHS seniors Pam Keller, Jonathan Roche and Hayleigh Sanders on earning an AP Scholar Award for their outstanding performance on last year’s AP exams. The College Board’s Advanced Placement Program (AP) provides high school students with the opportunity to take rigorous college-level courses and receive college credit upon successful completion. Only 18 percent of the 1.6 million students worldwide who took AP exams performed at a sufficiently high level to earn an AP Scholar Award. Kudos to Pam, Jonathan and Hayleigh for being among this national group of students! Jessica R. Albright, Lucas A. Altstadt, Rock G. Bolton, Ryan D. Fashempour, Grace Hsu, Michaela M. Killik, Colin Kloock, Katherine R. McLellan, Christopher G. Traylor, Carey C. Woods and Elizabeth L. Zak earned AP Scholar Awards. Michael T. Atkinson, Natalie Brdar, Tatiana Faria, Eric A. Miranda-Marin, Emily T. Nageotte and Hannah Wamble earned AP Scholar with Honor Awards. Benjamin P. Brown, James E. Coury, Taylor M. Eyssen, Ethan A. Kocjan, Scott D. Loeffler, Nicholas V. Macek and Jared N. Palazza earned AP Scholar with Distinction Awards. Michael R. Coury and Soumyajit Mazumder earned National AP Scholar Awards. 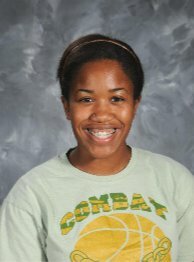 Congratulations to Bulldog senior Amber Black on being named a Semifinalist in the 2012 National Achievement Scholarship Program, an academic competition for Black American high school students! Of the more than 160,000 students who currently enter the National Achievement® Program each year, approximately 4,700 are honored. A group of about 3,100 Outstanding Participants are referred to colleges for their potential for academic success. A smaller group of only about 1,600 are named Semifinalists and are the only students who have an opportunity to advance in the competition for National Achievement Scholarships. 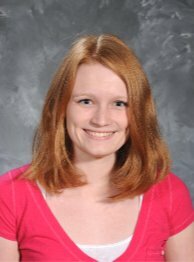 Congratulations again to Amber on being among this outstanding group of just 1,600 Semifinalist students nationwide! CROSS-COUNTRY BULLDOGS ARE DOUBLE CHAMPIONS! 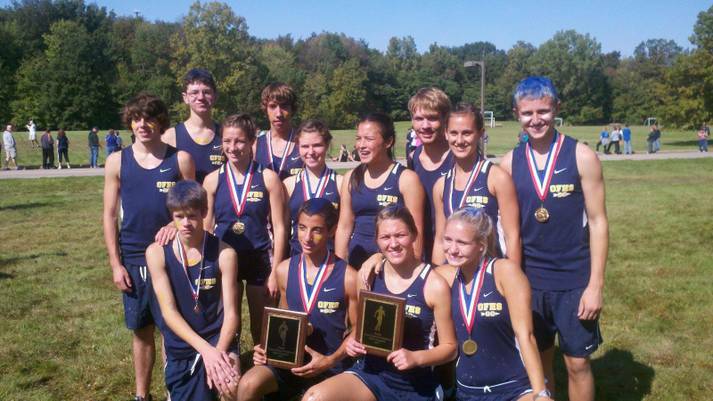 The Olmsted Falls boys and girls cross-country teams were both champions taking first overall at the Valley Forge Patriot Invitational this past Saturday, held on the campus of CCC West. The boys won handily, scoring 45 points, beating second place Padua by 20, as well as 14 other schools. This was the boys’ second straight championship at this invitational! The boys placed all 5 scorers in the top 20, including 3 in the top 5, and looked dominant. The boys were led by junior Troy Swiderski (3rd, 17:23), Edwin Rosa (sr., 4th, 17:43), Craig Partlow (so., 5th, 17:43), Ed Gorski (jr., 11th, 18:09), Dominic Dulin (so., 18th, 18:28), Eddie Zajac (sr., 19:12), and Josh Musial (so., 19:14). Despite the muddy conditions, these were the personal best times for each of these boys! The girls made their first trip to this invitational memorable by winning a tight race and edging out a very talented Madison squad, 51-63, and holding off SWC rival Westlake (68) as well. Leading the girls were Jaime Fossen (jr., 2nd, 21:21), Bridgit Mental (sr., 8th, 21:42), Brittany Carson (jr., 9th, 21:50), Lindsey Kaschak (jr., 14th, 22:15), Reilley Gomez (fr., 18th, 22:22), Katelynn Duplaga (jr., 22:28), and Caitlin Dahlin (sr., 23:02). The course deteriorated as the day went on, but several of these girls “mudded” their way through for personal best times as well! Congrats to both these teams on being champions! Last spring, 56 students in three third-level Spanish classes at Olmsted Falls High School took Spanish CAAP (Collaborative Articulation and Assessment Project) exam. 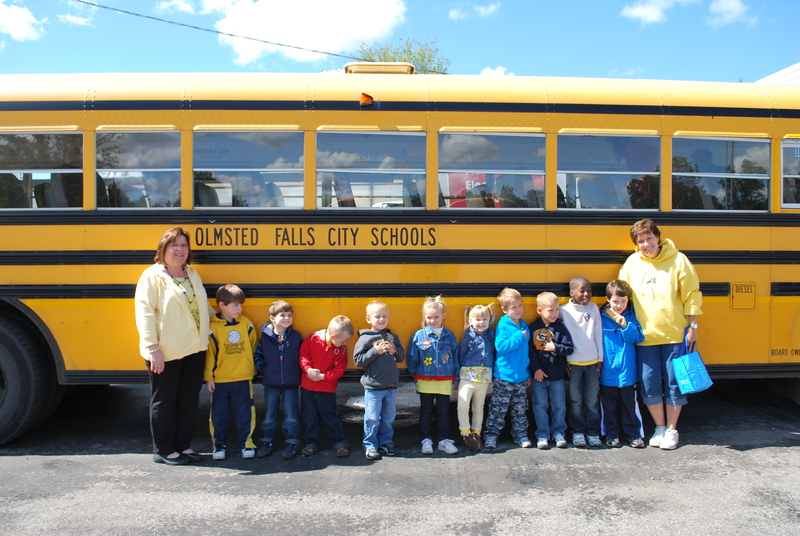 Olmsted Falls was one of 70 districts in the state who chose to participate in the voluntary project. 3,731 third year Spanish students from high schools across Ohio took the same assessment. The Spanish CAAP assessment gives students an indication of their potential university course placement. Listening, reading, and writing tests provide feedback to third-level high school students and their teachers. Since there is a not a state exam for foreign language, the Spanish CAAP exam project provides a comparison of a district’s student level and achievement in the third level of Spanish against other students and districts in the state. Overall, the third year Spanish students from OFHS tested above average in all three skills tested. The majority of the students who took the test would place into a third or fourth quarter level Spanish class at The Ohio State University! Congratulations to these outstanding students and our Spanish department at OFHS! This Monday, October 3rd, former Ohio State football player Joel Penton will be speaking to the District’s high school students at a special all school assembly scheduled for 9:00 a.m. in the High School gymnasium. Additionally, in the evening on Monday, October 3rd, Joel Penton will return to OFHS for a second appearance which is free and open to the entire Olmsted Falls community. The Monday, October 3rd evening event with Joel Patterson will take place in at High School Auditorium and begins at 7:00 p.m. All are welcome! Joel has quickly earned a reputation as one of the nation’s leading youth motivational speakers. His relevant approach to teen issues focuses on the POSITIVE results of good decisions instead of the NEGATIVE consequences of poor choices. Joel proves through his own personal stories of triumph that ordinary people can accomplish great things by simply making the right choices. As one of the top school motivational speakers in the country, Joel has shared his school assembly programs with more than 300,000 students. For more information on Joel Penton, please visit his website at www.joelpenton.com. ATTN: HIGH SCHOOL SENIOR STUDENTS AND PARENTS – COUNSELORS PARTNER WITH COLLEGE NOW TO PROVIDE INFORMATION SESSION FOR PARENTS AT OFHS OCTOBER 5TH, 4-6 P.M.
Senior parents and students with questions about the college application process are invited to attend this informal session to talk with their school counselor and the High School’s financial aid advisor, Mr. Dave Minich of College Now. Meet in the High School Library/Media Center to discuss questions and/or concerns relating to the college application process. The open house format invites parents and students to come in anytime between 4:00 p.m. – 6:00 p.m. on October 5th to ask questions. On October 8th, the OFHS Academic Team will host the Fall Kickoff Tournament at Olmsted Falls High School. Schools from across Northeast Ohio have been invited to participate again this year. Volunteers are needed who are willing to be readers/moderators for the tournament from 8:30 a.m. to 3:00 p.m. Lunch will be provided. It would involve reading questions, determining if the answer given is correct, and scoring those responses. A training session is scheduled for readers on Thursday, October 6th from 6:30 p.m. – 7:30 p.m. in the Media Center at the High School. This will enable the trainers to teach volunteers how to read/moderate a match, provide the opportunity to ask questions and gain confidence in the role. 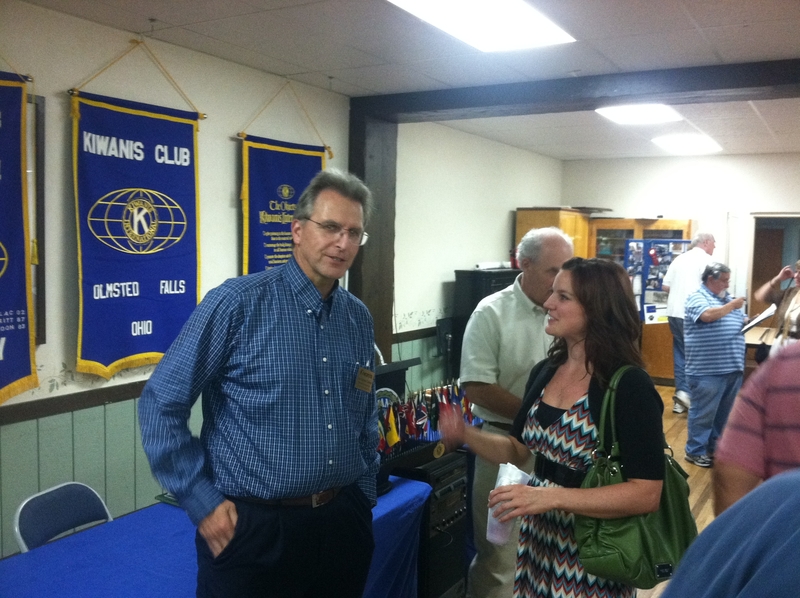 New teachers in the Olmsted Falls School District attended the September meeting of the Olmsted Kiwanis Club, in what has become a long-standing tradition of community building. Teachers join Kiwanis Club members for dinner, are introduced by their principals and get an opportunity to meet community members who are actively involved in supporting our schools. The meeting also provided an opportunity for Superintendent Dr. Todd Hoadley to update Kiwanis members on the latest news and developments in the Olmsted Falls School District. The Sun Post Herald ran an article on the District’s upcoming 5-year P.I. Levy in last week’s edition. This article also appears on-line. If you have not yet had an opportunity to read the article about this important issue for our District, please click here to read the article on-line. Please also see the item further down on today’s blog about opportunities to help with campaign efforts. All Olmsted Falls Alumni who are members of the Endowment and Alumni Association are encouraged to attend the next Annual Meeting on October 7 at 6 p.m. The meeting will be held in Room W-1 (Health Room) of the High School and will involve the election of new Board members. If you are a member of the Alumni Association, please consider running for one of the open positions on the Board this year and be a part of the Association whose mission is to raise funds for Senior scholarships. Declaration of Candidacy forms can be found here. If you are an Olmsted Falls graduate and would like to become a member, please complete a membership form and return to Jenny McKeigue at ofhsalumni@yahoo.com or regular mail at Olmsted Falls Schools Endowment and Alumni Association, P.O. Box 38244, Olmsted Falls, OH 44138. Olmsted Falls Schools is seeking community members who would like to become substitute paraprofessionals. Paraprofessionals work with special needs children in all of our buildings. This is a great way to see if this type of work is something you would enjoy and often leads to regular employment with the district. Please contact Mary Lopata at 440-427-6000 for more information about becoming a substitute paraprofessional. 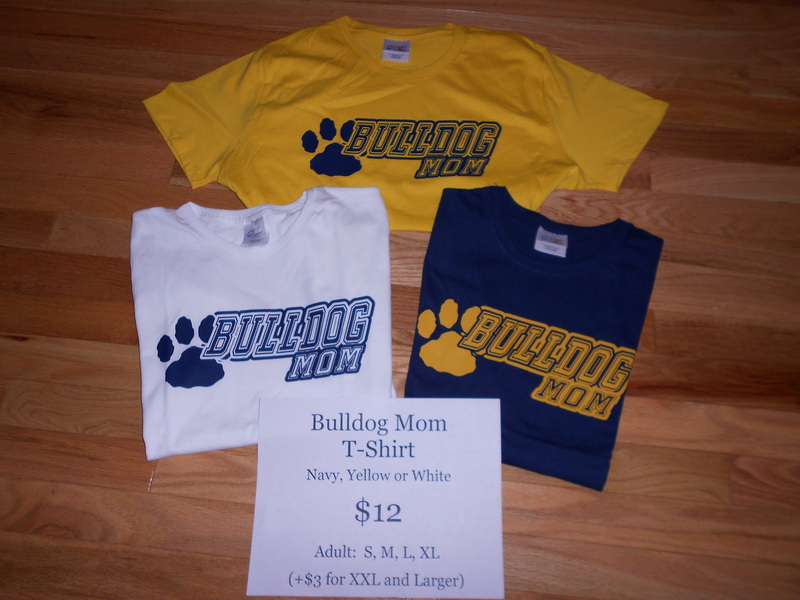 Olmsted Falls Middle School PTA is currently selling Spiritwear. 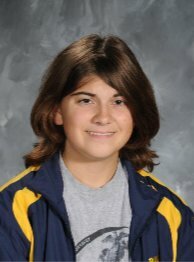 The 2011-2012 collection can be viewed on-line by visiting the OFMS PTA Spiritwear page on the website. Order forms can be downloaded there as well. Show your Bulldog spirit today! All proceeds from the OFMS PTA Spiritwear sale benefit OFMS PTA and its activities and scholarships. OFIS PTA FUNDRAISER – ENTERTAINMENT FUNDRAISING CORP.
Feed the cookie monster in your life and help support the OFIS cookie dough fundraiser! This fundraiser began on Friday, September 16 and runs through to Friday, September 30. Support of this fundraiser will help pay for field trips, assemblies, field day, right-to-read-week, the 5th grade luau and the many other activities sponsored by the OFIS PTA. Please help support your child by participating in this great fundraiser! There are many cookie dough choices to choose from! If you have any questions or need additional forms, please feel free to contact Vickie Lofton at tigmic1@sbcglobal.net. Thanks so much for all your help!!! * Krispy Kreme Donut Sales at home football games – get your fresh Krispy Kreme Donuts from OFMA! * Wing Night at Razzle’s on October 8th – please click here to download flyer. Thank you for your support of Bulldog music! “Walk and Talk!” – Please consider joining this important effort to inform the Olmsted community about the importance of the upcoming 5-year Limited Permanent Improvement Levy! Volunteers are needed for “Walk and Talk” efforts this Saturday, October 1st. A quick briefing/training session will take place each remaining Saturday at 10:30 a.m. at the Board Office, followed by the “walk and talk” from 10:45 a.m. to Noon. It’s quick. It’s easy…some might even say fun! And, most importantly, it makes a difference! Display a “Yes for Schools” Sign – The new supply of “Yes for Schools” signs has arrived!! To get yours delivered to your home, please e-mail prideinolmstedschools@gmail.com with the subject “Yard Sign.” Include your street address and a “Yes for Schools” sign will be placed in your yard by one of our volunteers. Many busy parents and residents have found the practice of Voting by Mail very convenient in recent elections – especially when the applications to request the absentee ballots were mailed to them automatically. Please note that applications to vote by absentee ballot are NOT being mailed for the November 8th election. HOWEVER, the applications will still be made available by the Board of Elections both on-line and at various public locations such as libraries. You can also pick-up Absentee Ballot Applications at the local library branch. Vote by mail or vote at the polls – just please be sure to vote! The Trustees of Olmsted Township have retained the Cuyahoga County Planning Commission to update the communities Comprehensive Land Use Plan and Zoning Resolutions. The Trustees are accepting letters of interest from residents in Olmsted Township who would be willing to serve on the Olmsted Township Master Plan Committee. Individuals interested in serving on this voluntary board should send their letter of interest to the attention of chairperson Sherri Lippus at 26900 Cook Road, Olmsted Township 44138. The North Olmsted Branch library has partnered with College Now of Greater Cleveland to host a series of programs for high school juniors and seniors, and their parents. The programs focus on financial aid, scholarships, and completing FAFSA forms. The first program date is coming up quickly on Oct. 4th. For program descriptions and dates, please click here. **In the Second, Third and Fourth Quarter the school with the highest percentage of participation per total enrollment will be featured in a web story on ClevelandBrowns.com. **The school with the highest participation in Touchdown for Reading overall will win a wrap-up party with a visit from a Cleveland Browns player! Participation is just like the summer reading game, but in football terms such as yards and quarters. For more information, please click here. In addition, please click here to view Fall programs at the Olmsted Falls branch. Thursday, September 29th – Olmsted Falls Basketball Association Hosting Travel Team Tryouts. If you were unable to make it to the tryout on Saturday, September 24, the newly formed Olmsted Falls Basketball Association (OFBA) will be holding makeup Travel Team tryouts Thursday, Sept. 29th from 6:45 p.m. to 8:30 p.m. in the Olmsted Falls Intermediate School gym. The fee is $5 and there will be a brief parent meeting at 6:55 p.m. Both genders and all age groups will be mixed together for the tryout. Please click here to download flyer with additional information. Sunday, October 2nd – 1 p.m. to 4 p.m. – Falls Day In The Park. The Parks & Recreation Board of the City of Olmsted Falls will host its annual Falls Day in the Park celebration on Sunday, October 2, 2011, from 1-4 pm at East River Park at 7878 Lewis Road in Olmsted Falls. Falls Day is a craft fair, a family event, and so much more. We will have a live band, the New Sunset Band, from 1-3 pm, donuts and cider, hot dogs, and other food, free crafts for the kids, old-fashioned family games such as kickball, strolling jugglers, police cars, fire trucks, and more. We will present the Citizen of the Year at 3 pm, and the Olmsted Falls High School Marching Band will cap off the day with a performance at 3:30 pm. Questions? Contact Sharon Knaggs at 440-463-8106 or City Hall at 440-235-5550. Thursday, October 6th – 8:00 p.m. – Why Teenagers Take Risks Presented by Baldwin-Wallace College. The Baldwin-Wallace College Department of Psychology will present an evening with Dr. Steinberg, one of the world’s leading authorities on psychological development during adolescence. Dr. Steinberg’s research focuses on adolescent brain development, risk-taking and decision-making, family relationships, after-school employment, school achievement and juvenile justice. Free and open to the public. Please click here for event flyer. Saturday, October 8th – 8 a.m. to 7 p.m. – Olmsted Performing Arts Garage Sale. On October 8, 2011, Olmsted Performing Arts will have a HUGE garage sale from 8 am – 7 pm at 26862 John Road, Olmsted Falls. In addition to all the incredible bargains you can score, celebrate the beginning of Fall with us! Purchase pumpkin rolls, hot apple cider, and roasted corn, and meet Dorothy and the Scarecrow from The Wizard of Oz. All proceeds will benefit Olmsted Performing Arts. And, if you would like to donate items, please contact marie@olmstedperformingarts.com. Saturday, October 8th – 9 a.m. to 12 p.m. – Olmsted Shredding Day. On Saturday, October 8th 2011, Northcoast Shredding will be at Falls Lenox Primary School to shred documents between 9:00 am and 12:00 pm. Magazines and newspapers will not be accepted for shredding, however, each of the schools have recycle units on site for newspapers and magazine collection. If you have any questions, please contact City Hall at: 440‐235‐5550 or Town Hall at: 440‐235‐3051. This service is brought to our community through the collaborative efforts of Olmsted Falls and Olmsted Township elected officials. 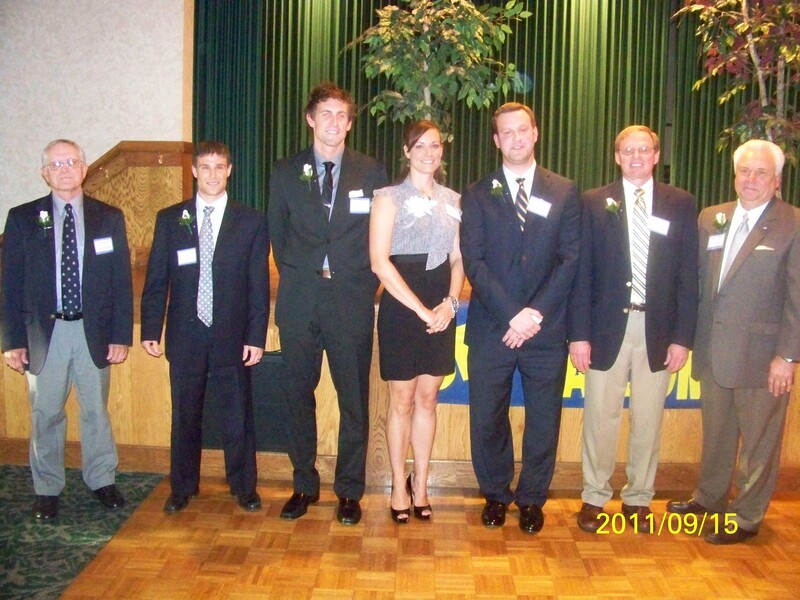 On September 15th, the Olmsted Falls Alumni Association inducted six outstanding athletes and one coach into the Olmsted Falls High School Athletic Hall of Fame. This year’s inductees include: Ron Molosky, ’61, George Fischer, ’71, John Storey, ’97, Abby Jaroscak Latra, ’98, Michael Gansey, ’01, Kyle Stoffer, ’01, and Jim Emigh, Coach. Click here to view these outstanding alumni bios and here for Coach Emigh’s bio. For more pictures from this event, click here. To nominate an outstanding alumni for the next Distinguished (2012) or Athletic (2013) Hall of Fame, please click on the category. Or, contact Alumni Association Director Jenny McKeigue at 440-427-6030 or ofhsalumni@yahoo.com. 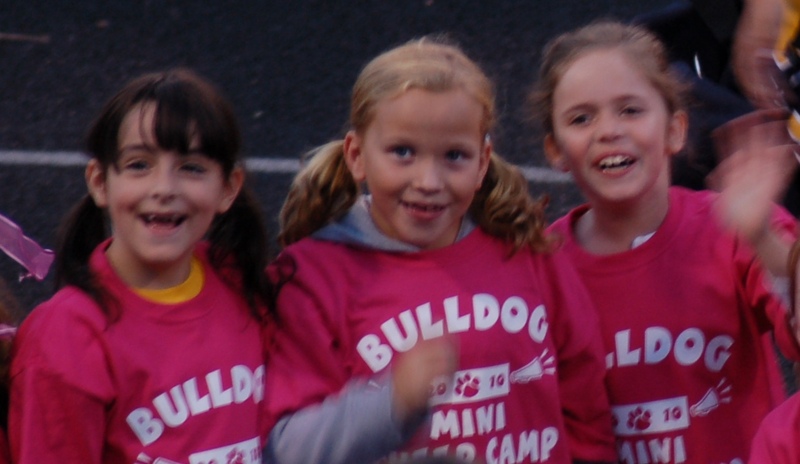 More than 250 young Bulldogs joined the OFHS Cheerleading squad on the High School track last Friday night to cheer on the Bulldog Varsity Football team . Lines of girls followed the lead of our High School cheerleaders with chants and routines that were learned during the annual Bulldog Mini Cheer Camp program. For a complete photo gallery from the event, please click here. HIGH SCHOOL POST PROM MEETING TONIGHT 7 p.m. Please note that the High School Post Prom meeting for September will take place tonight, September 21st at 7:00 p.m. in the High School Library Media Center. 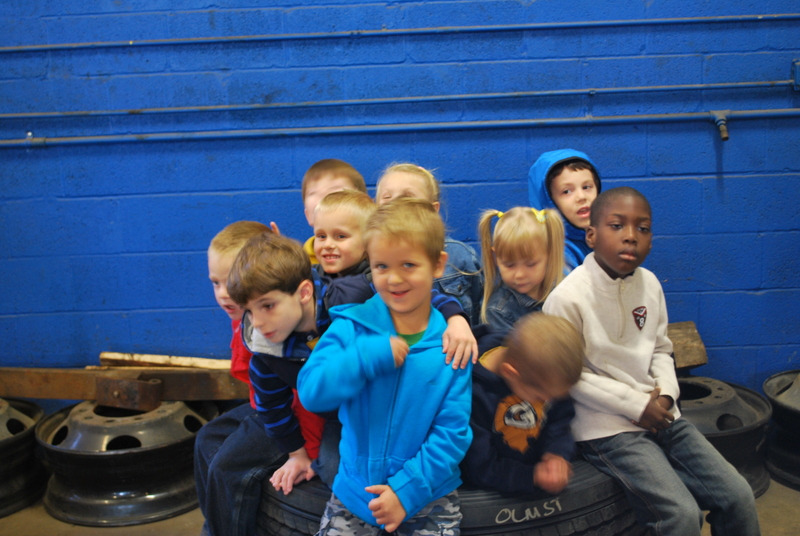 Preschool students from the Early Childhood Center took their first field trip last week to the District’s Bus Garage. This important field trip helps reinforce bus safety lessons and gives students the opportunity to learn about all of the important things that go on at the bus garage. Thank you to the bus garage staff and to the many parent volunteers that made this year’s trip a fun learning experience for our youngest Bulldogs! OFMS WEB Coordinators and Leaders hosted a WEB BBQ on Friday, September 9, 2011. The turnout was a huge success with 225 WEB and 6th grade students. Our WEB Coordinators greeted the 6th grade students with smiles, enthusiasm and excitement. Each student was served a hot dog, bag of chips and cookies. While the students ate dinner, they were able to share conversation about their school year, teachers and transition to the middle school. After dinner, our WEB Leaders and 6th Grade students were escorted to the first OFHS football game for the 2011-12 Season! The WEB coordinators would like to thank the WEB leaders and OFMS teacher volunteers for all of their support. Go Bulldogs! The K-Kids at OFIS coordinated a school-wide change collection fundraiser last week to benefit the annual Dakota’s Dream Fundraiser. The change collection lasted from 9/12-9/16 and culminated with a pajama day for Dakota’s Dream last Friday. The staff and students at OFIS raised over $2,500 for the Dakota’s Dream Fundraiser which benefits the Cure Tay-Sachs Foundation. Dakota Bihn is a student at OFIS this year. Dakota’s family, in concert with many other Tay-Sachs families, founded the Cure Tay-Sachs Foundation in June 2007 to fund research that shows promise to treat or cure Tay-Sachs disease. Kudos to all of the students and staff at OFIS for their enthusiastic participation in this effort! 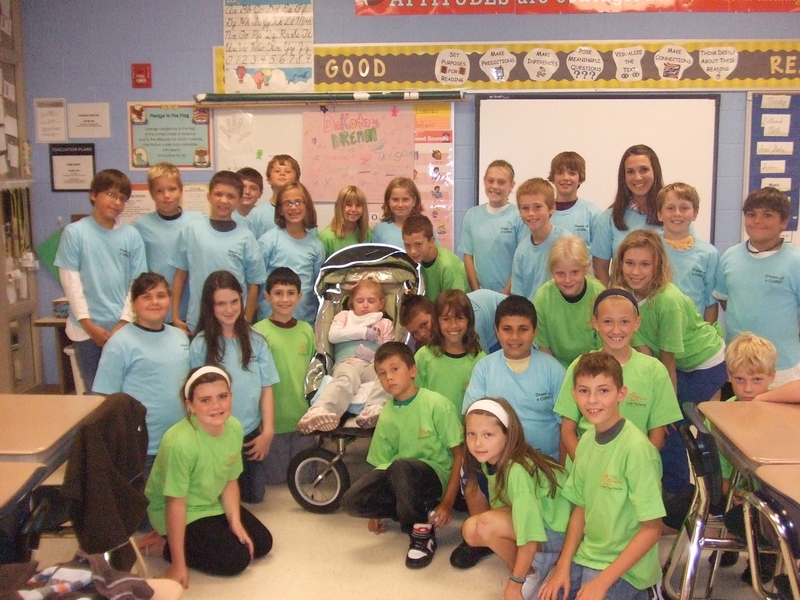 And, congratulations to Mrs. Atkin’s class (pictured above with Dakota) for raising the most money as a class – $270! The FALLS-LENOX/ECC PTA’s MARKET DAY fundraiser is winding down this week. The listed end date for this important fundraiser is today – however, order forms will be accepted through the end of this week. Don’t miss this opportunity to purchase great products and support your child’s school! This one and only fundraiser allows the PTA to provide field trips, assemblies, right-to-read-week, and other important programs to the students at Falls-Lenox and the ECC. Please help support your child through participating in this fundraiser! Product pick-up will be in October. Any questions, or for additional catalogs/order forms, please email Kristie Patton at kristiepatton@cox.net. Thanks so much for your help!!! SAVE THE DATE! SEPTEMBER PTA MEETINGS! “Walk and Talk!” – Please consider joining this important effort to inform the Olmsted community about the importance of the upcoming 5-year Limited Permanent Improvement Levy! Volunteers are needed for “Walk and Talk” efforts this Saturday, Sept. 24th; and Saturday, October 1st. A quick briefing/training session will take place each remaining Saturday at 10:30 a.m. at the Board Office, followed by the “walk and talk” from 10:45 a.m. to Noon. It’s quick. It’s easy…some might even say fun! And, most importantly, it makes a difference! Saturday, Sept. 24th – Olmsted Falls Basketball Association Hosting Travel Team Tryouts. The newly formed Olmsted Falls Basketball Association (OFBA) will be holding Travel team tryouts next Saturday, Sept. 24th. Please click here to download flyer with additional information. Saturday, Sept. 26th – 5:00 p.m. – O.F.S.A. Girls U14 Travel Soccer Showcase Match. The Olmsted Falls Soccer Association will be hosting one more “showcase” travel soccer match this weekend. The match against Fairview Park will be played at the Olmsted Falls High School field prior to the regularly scheduled High School matches. 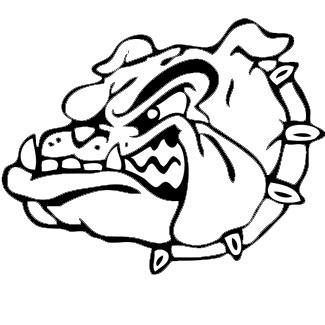 Come and support your future Bulldog Soccer Stars – game starts at 5:00 p.m. Olmsted Falls High School soccer field is located behind the Olmsted Falls Middle School at 27045 Bagley Road. For more information on the Showcase matches and O.F.S.A., click HERE or contact Joe Vitale at joevitalejr2003@gmail.com. Power has now been restored to the Intermediate School, Middle School, High School and Board Office. A local power outage in Olmsted Township this morning resulted in a temporary loss of power at three District school buildings and the Board office. All power has now been restored. Thank you. 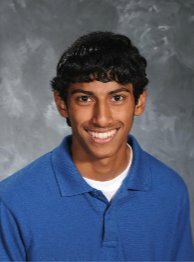 Congratulations to Pam Keller and Sohan Vartak on being named as Semi-Finalists in the 2012 National Merit Scholarship Program. These academically talented Olmsted Falls High School seniors have the opportunity to continue on in this prestigious competition for some 8,300 National Merit Scholarships, worth more than $34 million, that will be offered next spring. About 1.5 million juniors in some 22,000 high schools across the country entered the 2012 National Merit Scholarship Program by taking the Preliminary SAT/National Merit Qualifying Test (PSAT/NMSQT), which served as an initial screen of program entrants. The nationwide pool of Semifinalists, which represents less than one percent of U.S. high school seniors, includes the highest scoring entrants in each state. Kudos to Pam and Sohan on this outstanding achievement and best of luck as the competition proceeds into the spring! From the approximately 16,000 Semifinalists nationwide, about 15,000 are expected to advance to the Finalist level, and in February they will be notified of this designation. All National Merit Scholarship winners will be selected from this Finalist group. Attention Parents of Preschool and Kindergarten Students! You are encouraged to attend the Open House event at the Olmsted Falls Early Childhood Center TONIGHT, Wednesday, September 14th. Meet the new Early Childhood Center Director Mrs. Melinda Brunner, visit your child’s classroom and learn more about parent groups such as PTA. ** Please note the end time for the first session and the start time for the second session have been adjusted slightly to allow for some of the families who are coming to the AM session to get out of the parking lot before the families of the PM session arrive. This is an effort to alleviate parking congestion in the ECC lot and allow for a maximum number of families to park at the ECC – instead of having to park across the street at the church and walk across Fitch Road. Today – Wednesday, September 14th – was the first Late Start Day (High School ONLY) of the 2011-2012 school year. To download a copy of the Late Start Schedule for this year, please click here. Please note that for High School Late Start Days, bus routes will be run as usual in the morning for students needing to arrive at the regular time or for students needing to catch the Polaris transfer bus. For late arriving students, the eight PM High School bus routes will be run in the morning with pick-ups beginning at 8:45 a.m. Pick up times will be approximately 2 hours later than usual. Students will be dropped off at the high school at 9:15 a.m.
Feed the cookie monster in your life and help support the OFIS cookie dough fundraiser! This fundraiser begins on Friday, September 16 and runs through to Friday, September 30. Support of this fundraiser will help pay for field trips, assemblies, field day, right-to-read-week, the 5th grade luau and the many other activities sponsored by the OFIS PTA. Check your child’s backpack… the FALLS-LENOX/ECC PTA’s MARKET DAY fundraiser begins today!! It is scheduled for 2 weeks, from September 7th to September 21st, with a product pick-up date in October. This one and only fundraiser allows the PTA to provide field trips, assemblies, right-to-read-week, and other important programs to the students at Falls-Lenox and the ECC. Please help support your child through participating in this fundraiser! Any questions, or for additional catalogs/order forms, please email Kristie Patton at kristiepatton@cox.net. Thanks so much for your help!!! Check out the new Bulldog Bulletin! This new online newsletter allows the Falls-Lenox/ECC PTA to share committee news, make requests for assistance, celebrate accomplishments, and express appreciation quickly and easily. Information is archived and made searchable by committee, topic, or keyword. Read the site in realtime or sign-up for email notifications of new content at www.fleccpta.com or through the new Falls-Lenox/ECC PTA Facebook page. 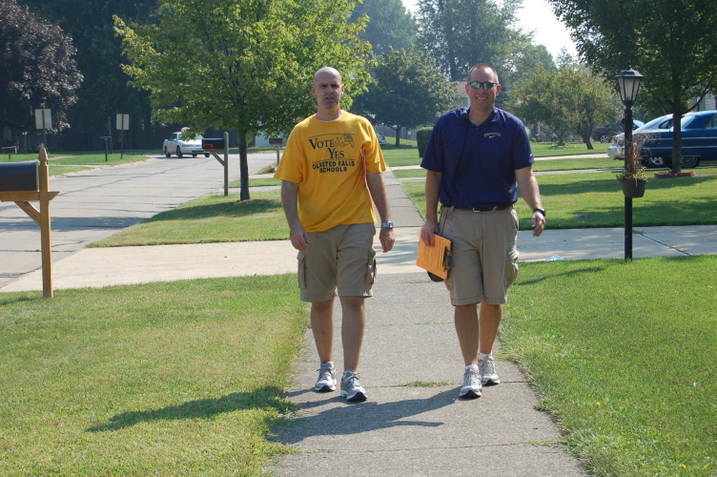 “Walk and Talk!” – Please consider joining this important effort to inform the Olmsted community about the importance of the upcoming 5-year Limited Permanent Improvement Levy! Volunteers are needed for the following “Walk and Talk” efforts: this Saturday, Sept. 17th; Saturday, Sept. 24th; and Saturday, October 1st. Please e-mail prideinolmstedschools@gmail.com if you are available to help. A quick briefing/training session will take place each scheduled Saturday at 9:30 a.m. at the Board Office, followed by the “walk and talk” from 10 a.m. to Noon. It’s quick. It’s easy…some might even say fun! And, most importantly, it makes a difference! 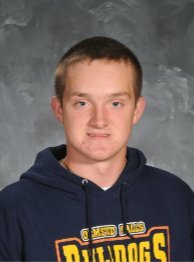 He is looking for Bulldog alumni that graduated in 2008, 2009, and 2010, and who participated in AP (Advanced Placement) or PSO (Post Secondary Option, college classes) courses while attending Olmsted Falls High School. Participation in this study simply involves the completion of a questionnaire that may be filled out and submitted online. If you know an Olmsted Falls graduate who meets the above criteria and may be interested in participating in this study, please pass along the following contact information for them to get in touch directly with Mr. Wachowiak: 440-233-6313 (phone), george.wachowiak@clearviewschools.org (school e-mail), or gmwach5922@sbcglobal.net (personal e-mail.) Thank you. The newly formed Olmsted Falls Basketball Association (OFBA) will be holding Travel team tryouts next Saturday, Sept. 24th. Please click here to download flyer with additional information. Games will be played prior to regularly schedule high school matches, at the Olmsted Falls High School soccer field, located behind the Olmsted Falls Middle School at 26937 Bagley Road, Olmsted Falls, Ohio. For more information on the Showcase matches and O.F.S.A., click HERE or contact Joe Vitale at joevitalejr2003@gmail.com. 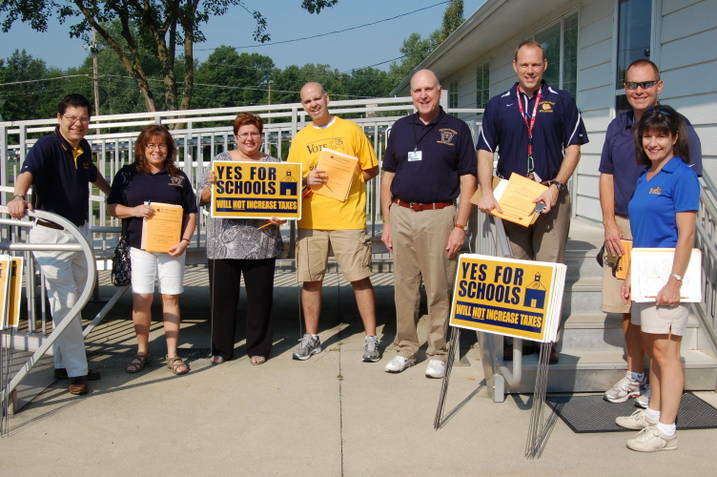 A group of Olmsted Falls administrators, Board members and parents took their levy information campaign to the streets over the long holiday weekend as they knocked on doors to personally talk to residents about the importance of the upcoming 5-year Limited Duration P.I. Levy on the November ballot. The overall response was very positive with many residents agreeing to display yard signs to help further promote the efforts of the information campaign. These one-on-one conversations go a long way toward communicating the benefit and simplicity of this important levy to our residents. It helps to personally underscore and explain to people how this 5-year limited P.I. Levy works and why it will NOT raise their current level of school taxes. Olmsted Falls School District has placed a 2.8 Mill 5-Year Permanent Improvement Levy on the November 8th election ballot. This new levy has been strategically timed to correspond with the “roll-off” of existing levy millage in the same amount – which means that the current level of school taxes will remain the same. By law, because it is a new type of levy, the ballot language must read “Additional,” however the corresponding millage “roll-off” ensures that the current tax level will not increase. District officials and levy volunteers plan to continue their door-to-door “walk and talk” efforts in the coming weeks. Please consider joining this important effort! Volunteers are needed for the following “Walk and Talk” efforts: Saturday, Sept. 17th; Saturday, Sept. 24th; and Saturday, October 1st. Please e-mail prideinolmstedschools@gmail.com if you are available to help. A quick briefing/training session will take place each scheduled Saturday at 9:30 a.m. at the Board Office, followed by the “walk and talk” from 10 a.m. to Noon. Funds generated from the 5-year P.I. Levy will be largely focused on upgrades and renovations to the 43-year-old Olmsted Falls High School facility. For additional information or questions on the 5-year P.I. Levy, residents are urged to contact the Olmsted Falls Board of Education at 440-427-6000. Did you know that all levy activities and materials are funded by private donations to the Pride In Olmsted Schools organization. By law, no school district funds can be used for levy campaign efforts or materials. Levy information materials such as brochures, flyers and yard signs are all paid for by the Pride In Olmsted Schools Committee. Vote by mail or vote at the polls – just please be sure to vote! Any parent or resident having questions about the Local Report Card ratings for Olmsted Falls Schools, and/or questions about the new rating system, are invited to join Superintendent Dr. Todd Hoadley in the Olmsted Falls High School Library TONIGHT, Wednesday, September 7th between 7 – 8 p.m.
Parents and residents may also contact the Board of Education Office at 440-427-6000 with any questions. The Middle School is hosting a WEB BBQ for 6th grade students and 8th grade WEB leaders before the first home football game this Friday night. Students will eat at the Middle School and then walk over as a group to watch the Bulldogs play in their first varsity home game of the season. 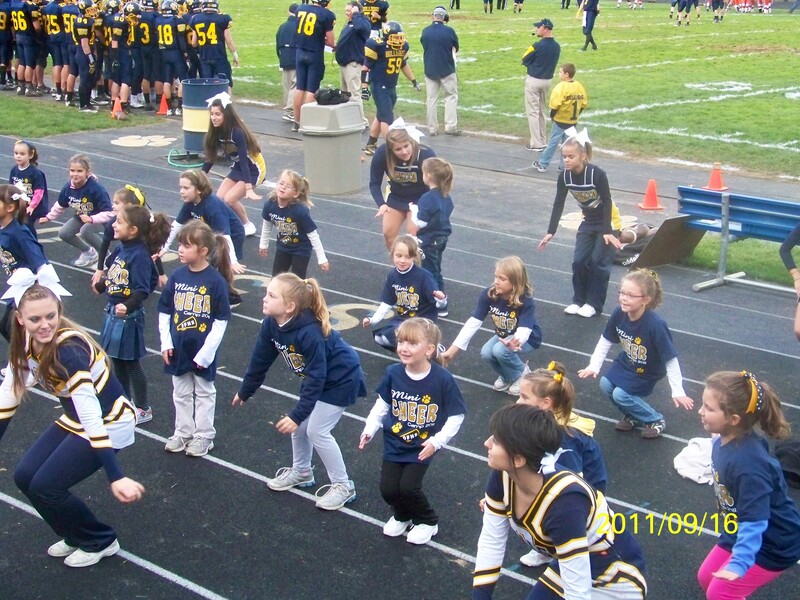 Last year, approximately 300 young Bulldogs joined the OFHS Cheerleading squad to cheer on the Bulldog Varsity Football team. Lines of girls followed the lead of Olmsted Falls High School cheerleaders with chants and routines that were learned during the annual Bulldog Mini Cheer Camp program. This program will be offered again this year. Please click here to download the registration form. A.M. Preschool/Kindergarten 6:45pm; P.M. Preschool/Kindergarten 7:30p.m. Sept. 8th OECPTA Meeting – TOMORROW NIGHT! All parents are invited and encouraged to get informed and get involved! Display Your Yard Signs! – Anyone who has a “Yes for Schools” sign from the May campaign tucked away in your garage, now is the time to pull it out and display it once again in your yard. For those in need of a yard sign, please send an e-mail to prideinolmstedschools@gmail.com (Subject Line: Yard Signs). 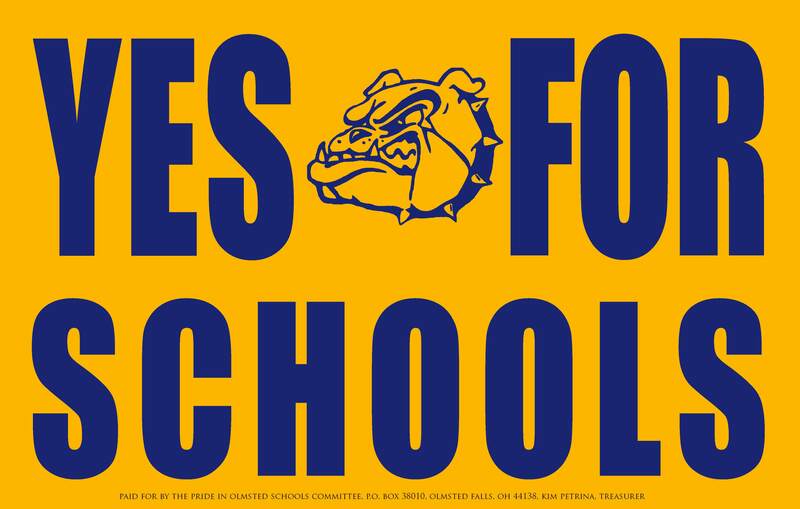 Be sure to include your street address and indicate if you would like a “Yes for Schools” sign, a “Bulldog Pride” sign, OR BOTH! Pride volunteers will deliver the sign(s) right to your yard! 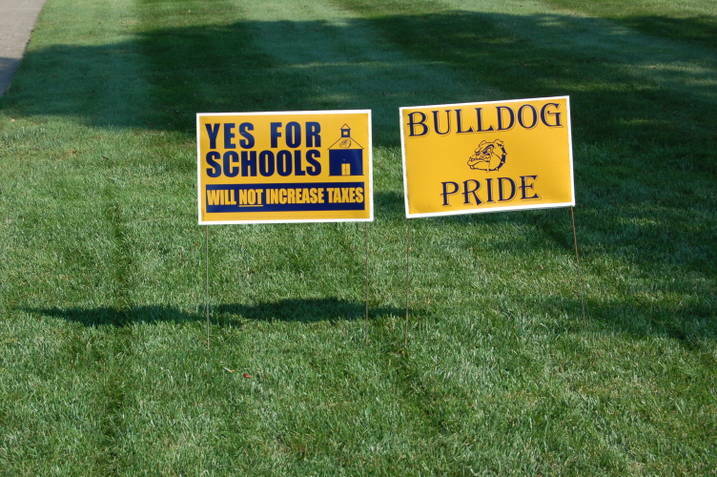 **Important Note: The Pride Committee is currently very low on its supply of “Yes for Schools” yard signs. If you have requested a sign, but have not yet received it, please know that your name has been added to the waiting list and a sign will be delivered to you by the end of next week, once the new supply comes in. “Walk and Talk!” – Please consider joining this important effort! Volunteers are needed for the following “Walk and Talk” efforts: Saturday, Sept. 17th; Saturday, Sept. 24th; and Saturday, October 1st. Please e-mail prideinolmstedschools@gmail.com if you are available to help. A quick briefing/training session will take place each scheduled Saturday at 9:30 a.m. at the Board Office, followed by the “walk and talk” from 10 a.m. to Noon. It’s quick. It’s easy…some might even say fun! And, it makes a difference! QUESTIONS?? Parents and residents are encouraged to contact the Board of Education Office at 427-6000 with any questions.